Kateri started work yesterday. That’s right. My little girl has a job. A job, people! Well, she’s not actually getting paid or anything, but the stable where she has taken riding lessons for the past 8 years has offered her a “work for riding” opportunity. 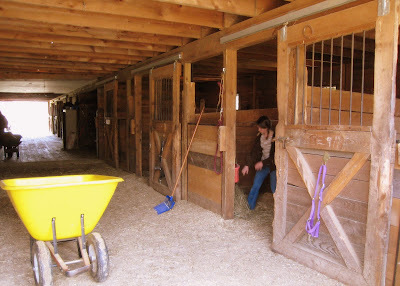 She works in the barn and grooms the horses in return for free riding. Well now, riding is worth more to this particular 13 year old than any paycheck could ever be. Not to mention the fact that just being in the barn and caring for the horses feels more like heaven than “work” to her. My mother heart can rest. She’s not leaving home yet, just going to the barn. All in all, a mighty fine arrangement.